Work no longer has to be a place. As the world of web-entrepreneurship and digital nomadic life becomes more and more mainstream, people are starting to realize that it's easier than ever to make good money online. These aren't get rich quick schemes by any means, and it will take a considerable amount of time and commitment to truly excel in these fields, but who doesn't want to earn $100K per year from virtually anywhere in the world? Here are five jobs that can help you do just that. If you thought that travel blogging was just a hobby, you're not alone. In fact, before I started my travel blog in 2011, I had no idea that I would one day be earning over $10,000 a month after tax, doing what I love. The great thing about becoming a travel blogger is the perks that come along with the salary. $100,000 a year sounds great, but when you couple that with airlines flying you for free and tourism boards paying for all of your accommodations, food, and travel, it's pretty much the ultimate dream job. Travel bloggers who are doing it right barely have any day-to-day expenses, despite the fact that they’re living a life fit for millionaires. Because there are literally thousands of travel blogs online, the market is definitely saturated, but that doesn't mean it's impossible to etch out a niche and make real money from this line of work. If you want to leave your cubicle behind and turn the world into your office, consider learning how to start travel a blog today. It could change your life. If you love a good game of five-card stud, this job may just sound like it's too good to be true. The fact that you can sit on your computer and play digital poker, while looking out at a Caribbean beach, is a dreamlike thought for sure. But for online gamblers like Patrick Leonard, it is not uncommon to have single days where winnings break the $100,000 mark. Forget making more than six-figures per year, this guy once earned $220,000 on a rainy Sunday afternoon in Hungary (where he currently lives). It should be noted that most estimates point to 90% of all online poker players coming out on the losing end, which is why online poker sites make so much money. But if you're a freakishly good poker player like Patrick, you could make it rain digital dollars all over the world. Designing websites can be a lucrative career, especially if you build a name for yourself and you start having big brands knocking on your door, asking you to pimp their blogs. Of course becoming a web designer isn't something you can do overnight. Have you ever seen the code behind a website? It's an entire language that you have to learn before you can start to customize the look of the web. But if you have a background in CSS, HTML, PHP, and other geeky web acronyms, then you can probably earn a good living from your computer, no matter where you are in the world. For some reason, the sound of day trading on the stock market already has a wealthy ring to it. You may picture a dude with slicked back hair, holding a glass of scotch while betting on the changing stock market from a five-star hotel in Maui. Well, if you go to successful day trader Marcello Arrambide's website, you'll see just that. Like online poker playing, making money as a day trader is a gamble and if you have no prior experience, you're likely to lose before you gain — but this job is no joke. Some top earners are making upward of $20,000 a month, and they can do it from anywhere that has a decent Wi-Fi connection. The difference between a travel writer and a travel blogger is that a travel writer is getting paid to write for other publications, while a travel blogger is probably making most (or all) of their income from writing on their own site. Earning six figures a year as a freelance writer is a difficult job indeed. Tim Leffel, one of the world's leading experts in travel writing, explains that making money as a freelance writer is truly a world of feast and famine. One minute you can have numerous publications waiting to feature you, while the next, you may be barely earning anything, just waiting for an assignment. Despite the relative uncertainty of income, some of the world's top-earning travel writers do take home $100K a year or more and they live a life that many of us could only dream of. Exploring the world, getting published in big magazines, and sharing their stories and adventures with millions of people. What a life. If you read the word "YouTuber" and immediately thought that there's no way anyone is making real money from uploading videos to YouTube, you might just pass out when I tell you that the top earning YouTuber, Felix Kjellberg, is grossing over $12 million per annum. The 25-year-old Swede runs the popular gaming channel PewDiePie, and he is not alone in making millions of dollars from Internet videos. Rhett McLaughlin and Charles Lincoln Neal III made over $4 million in 2015 and there are literally dozens of other creators making seven to eight figures per year from their YouTube channels. For channels to earn this much money, they have to have a huge following. The top 10 YouTubers have a combined subscriber base of more than 230 million viewers and their most watched videos have had more views than the 2015 Super Bowl. Taking all of this into consideration, it's no surprise that these artists are making big money. If you're just starting out as a YouTuber, it may feel like you have nobody watching your videos, but if you promote yourself and market your channel properly, you could one day earn a solid income from embedded ads and sponsorships. Have you ever played the game Candy Crush on your smartphone? While you were aligning jelly beans and stopping chocolate blockers, you probably weren't aware that the app currently earns an estimated $1,176,816 per day. Of course, the average programmer isn't going to make as much as Toby Rowland, the creator of the Sugar Crush Saga, but there are many app developers out there making good money from their digital creations. Simon Fairbairn and Erin McNeaney of Never Ending Voyage have created a brilliant travel app called Trail Wallet that is selling very well in the App Store and earning them a reliable income. The app helps travelers to track their budget and has been downloaded thousands of times from the app store. What is affiliate marketing? According to Pat Flynn, founder of the Smart Passive Income Blog: "It's the process of earning a commission by promoting other people's (or company's) products. You find a product you like, promote it to others, and earn a piece of the profit for each sale that you make." Forget earning $100,000 a year, Pat earns that every month and he does so using a passive income model, which means he doesn't spend every waking hour of his life on his computer. His blog is the most informative on the subject and he helps to teach others how to make a full-time income from affiliate sales. While having a blog with a huge amount of traffic like Pat's definitely helps to generate sales, there are plenty of people with much less traffic who are still making a lot of money through affiliate marketing. If earning money in your sleep sounds appealing to you, you may want to check out Pat's blog and consider starting your own blog today. 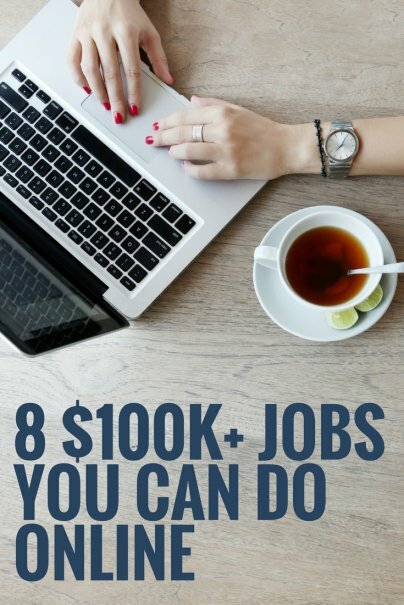 These jobs may have once been reserved for people with fancy degrees, a background in technology, or Internet geniuses, but these days there are enough resources online that pretty much anyone can make money from their computers. Like the people in the examples above, you could work hard and one day be earning a six-figure income from your laptop. The great thing about computer work is that you can start it in your free time, while you’re still working your normal job. If your online business takes off, you can retire to a life of digital freedom. Have you or someone you know earned a good income online? How did it work? Share with us in the comments below.